Durango’s Todd Wells had a tough Whiskey Off-Road backcountry race, as he finished 23rd after a leaking tire and empty legs derailed his race. But the Epic Riders series defending champion opened the weekend with a second-place finish in the criterium in Prescott, Arizona. A New Zealander took Durango’s best shot this year at the Whiskey Off-Road. In the first of three stops on the Epic Rides professional mountain bike series, 14 Durangoans competed in the Whiskey Off-Road backcountry race last Sunday in Prescott, Arizona. But it was 21-year-old Sam Gaze of Tokoroa, New Zealand, that stole the show, as he won the 50-mile cross country mountain bike race in 3 hours, 7 minutes, 17 seconds. He beat out Durango’s Howard Grotts, who finished close behind in 3:07:51. Gaze has been a force the last two weekends in the U.S. The under-23 world champion won the short-track race at the Sea Otter Classic a week earlier in a field that included reigning world champion and Olympic gold medalist Nino Schurter of Switzerland. It was another strong weekend of racing in the U.S. for Grotts, who was fourth in short-track and third in cross-country at the Sea Otter Classic. The Olympian from Durango was second at the US Cup stop April 8 at Bonelli Park, California. Sunday in Prescott, Grotts finished well-ahead of third-place Kristian Hynek of the Czech Republic, who crossed the line in 3:09:19. Durango’s young phenom Christopher Blevins placed fourth in 3:14:48. Durangoan Benjamin Sonntag was seventh in 3:17:33 to give the town three top-10 finishers in a race that has quickly become a marquee event. The added prize purse for the overall champion after the three stops in Prescott, Grand Junction and Carson City, Nevada, has helped draw the top riders in the country and, now, international talent. A year ago, Durango’s Todd Wells, a three-time Olympian, won the overall series title and the big bonus check of $10,000. He earned the honorary No. 1 plate to start this year’s series. But he had a tough start at the Whiskey 50, as a mechanical issue stopped him for a full minute and made it difficult for him to climb back to the front. Wells’ legs didn’t have enough juice after the early setback. He said he was doing well on the ride down to Skull Valley, but the climb back out is when he began to suffer. Wells settled for a 23rd-place finish in 3:29:05 and will need to make up a lot of time in the next two stops to repeat as the series winner. Durango’s Payson McElveen finished 15th in the event in 3:21:01. Rotem Ishay was 21st in 3:27:29. Two Durangoans finished directly behind Wells, as Levi Kurlander (3:29:34) was 24th and Stephan Davoust (3:30:38) was 25th. Nick Gould (3:33:33) added a 31st-place finish, Rolando Gonzalez (3:34:31) opened his season in 33rd, and Troy Wells (3:36:35) finished in 38th. Animas High School student Keiran Eagen finished in 46th in 3:41:34. That beat the time of his Team CRC Janitorial coach Caleb Thompson, who finished 50th in 3:46:25. Durango;s Jorge Munoz Jr. also finished 72nd in 4:22:55. In the women’s open 50-mile race, Durango’s Sarah Sturm finished 15th in 4:22:43. Sofia Gomez-Villafañe, a Fort Lewis College alumna who now resides in Park City, Utah, was 13th in 4:19:34. The race was won by Kate Courtney of California. She finished in 3:41:19. Erin Huck of Boulder was second in 3:51:02. Gaze also won the fat-tire crit, but it was Todd Wells close behind in second well ahead of the rest of the pack. Geoff Kabush of British Columbia, Canada, finished third, Derek Zandstra of Ontario, Canada, was fourth, and Grotts crossed in fifth. Making the fat-tire crit unique is the cyclists are required to ride the same set up they will use in the backcountry race later in the weekend. The tires are allowed to change, but they have to be at least 1½ inch wide. There is no prize money, so it’s all about putting on a show. Sonntag was seventh in the crit, and McElveen finished ninth. Gonzalez came in 15th, Michael Sampson was 17th, Thompson finished 20th, Blevins was 25th, Troy Wells took 26th, Ishay was 27th, and Davoust finished 29th. Also for Durango, Gould placed 31st, Levi Kurlander took 32nd, Munoz Jr. was 52nd, and Eagen placed 53rd. In the women’s crit, Huck won the race in front of Courtney. Durango’s Sturm was 15th. Amateur races also were held with options to race 50, 30 or 15 miles. In the 30-mile race, Durango’s Kenny Wehn was first in the men’s masters (45-and-older) category in 2:38:53. Iron Horse Bicycle Classic Race Director Gaige Sippy competed in the 30-mile race and finished in 3:08:59, one second ahead of Ivan Sippy. Camry Sippy also finished the race in 3:15:53. Mike Hicks of Durango crossed in 3:34:15, Jenna Emerick finished in 3:49:44, and Field Blevins, father of Chris Blevins, finished in 3:50:23. Jay Eagen also completed 30 miles in 4:17:41. Durangoans opted to go big all weekend, as none signed up for the 15-mile, opting for the longer races instead. 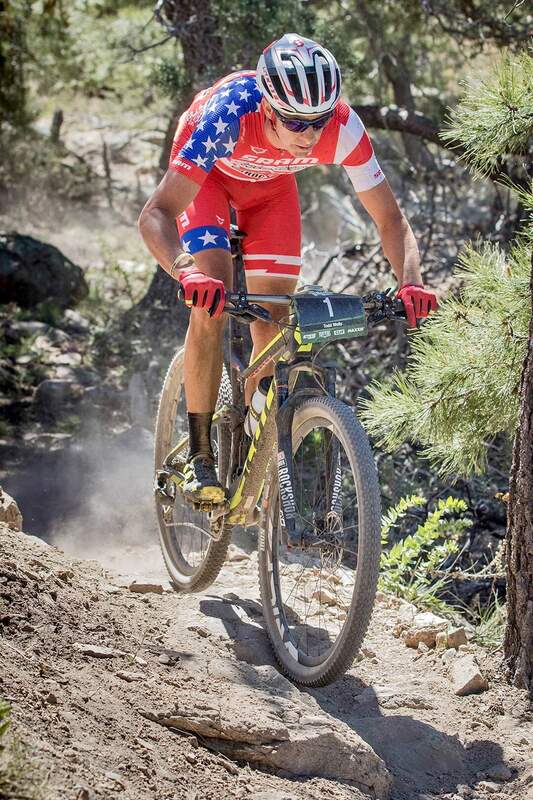 Next up for Grotts, McElveen and Todd Wells is the USA Cycling Marathon Mountain Bike National Championships on May 7 in Arkadelphia, Arkansas. He will look to defend his national title from last year. “I’m hoping for a quick turnaround,” he said.